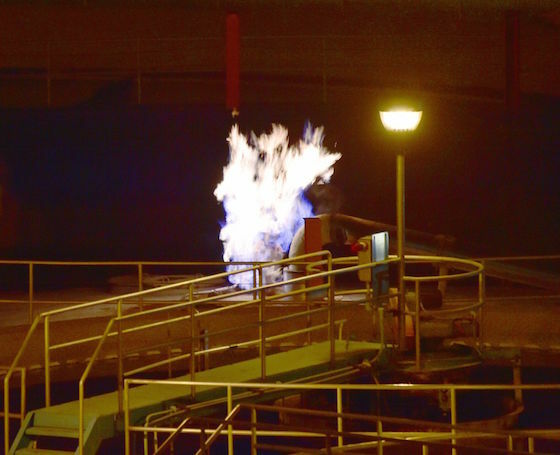 Flames shoot from a tank at a Billings, MT, wastewater treatment plant as methane gas burns. The cause of the methane-containing tank that caught fire at the waste water plant in Billings, Montana, early Tuesday morning is under investigation. It is unknown what caused the fire at this time. However, Billings Public Works Director Dave Mumford said the methane in the tank may have been ignited by the electrical system. The tank that ignited is a secondary digester, a holding tank in which microbes break down sewage and release methane during the process. The methane is then either used to run a generator that powers the plant or is flared off. No flaring was taking place when the fire began, Mumford said. Billings police closed several streets accessing the plant which included an entrance behind MetraPark, Bench street, Hilltop and nearby bike paths. Billings police cleared the streets and opened them at 4 a.m. Emergency services responded to the call Tuesday at 1:30 a.m. of a fire by methane leak at the waste water treatment plant. It is unknown what caused the fire, but Sgt. Robert Lester from the Yellowstone County Sheriff’s office said they are working closely with the fire department to ensure everyone’s safety. A plan was put in place to evacuate people from their homes, but Assistant Fire Chief Pepper Valdez said he was thankful they did not have to. Initially they weren’t able to close a valve near plant leaking methane, but were able to send a safety team in to do so and cut off the gas, Valdez said. The fire caused about $15,000 in damage, Deputy Billings Fire Marshal Jeff McCullough stated in a press release later Tuesday, and the cause remains under investigation. Billings Public Works Director Dave Mumford said Tuesday morning that the methane in the tank may have been ignited by the electrical system. Officials at the scene initially believed that a methane storage tank had ignited. Mumford later clarified that no methane is stored on the plant property and that he isn’t aware of any possibility of such a fire causing an explosion.